Sandy Overton may be 87, but good luck keeping up with her. Today, she goes from room to room, lifting the spirits of some of the hospital's sickest patients and easing a little bit of the loneliness that often comes with a hospital stay. BOULDER, Colo. -- Sandy Overton may be 87, but good luck keeping up with her. "She's a quick one, that's for sure," said one of her colleagues as she raced by. Two days a week, you'll find her buzzing around Boulder Community Health, giving her time to the place she first came as a patient. That was 46 years ago. Today, she goes from room to room lifting the spirits of some of the hospital's sickest patients and easing a little bit of the loneliness that often comes with a hospital stay. "The staff are very busy and they, too, spend time at the bedside. But they don't have the unlimited amount of time to be able to stay and visit with someone who's lonely, who wants to talk – someone who might not have family to be here," said Pat Diamond, the Director of Volunteer Services at Boulder Community Health. "When volunteers like Sandy are no longer able to volunteer with us, it'll be the end of an era because we won't see volunteers who give us 40, 50 years." It's Sandy's unwavering compassion and her dedication to her community that make her a 7Everday Hero. "I get more than I give really. 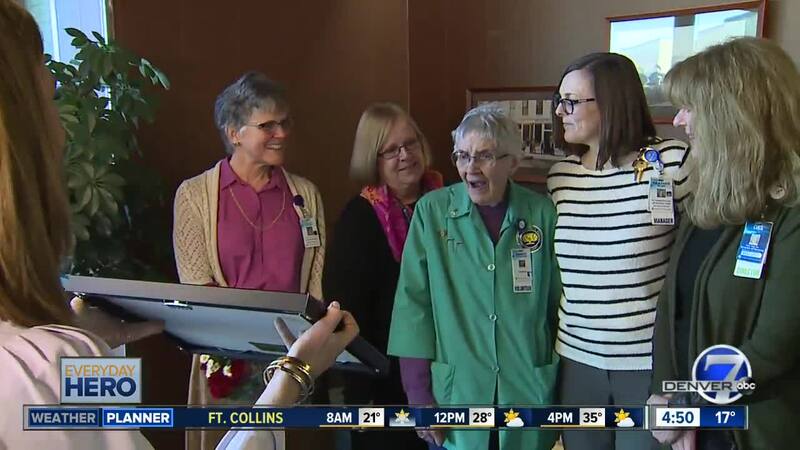 It's just enjoyable being able to maybe bring a smile to a patients face," Overton said.